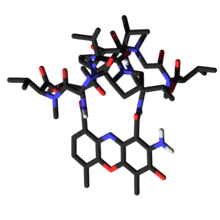 Dactinomycin, also known as actinomycin D, is the most significant member of actinomycines, which are a class of polypeptide antitumor antibiotics isolated from soil bacteria of the genus Streptomyces. It is one of the older anticancer drugs, and has been used for many years. 1 2 Hollstein, U. (1974). "Actinomycin. Chemistry and mechanism of action". Chemical Reviews. 74 (6): 625–652. doi:10.1021/cr60292a002. ↑ Turan T; Karacay O; Tulunay G; Boran N; Koc S; Bozok S; Kose M (2006). "Results with EMA/CO (etoposide, methotrexate, actinomycin D, cyclophosphamide, vincristine) chemotherapy in gestational trophoblastic neoplasia". Int J Gynecol Cancer. 16 (3): 1432–8. doi:10.1111/j.1525-1438.2006.00606.x. PMID 16803542. ↑ D'Angio GJ; Evans A; Breslow N; Beckwith B; Bishop H; Farewell V; Goodwin W; Leape L; Palmer N; Sinks L; Sutow W; Tefft M; Wolff J (1981). "The treatment of Wilms' tumor: results of the Second National Wilms' Tumor Study.". Cancer. 47 (9): 2302–11. doi:10.1002/1097-0142(19810501)47:9<2302::aid-cncr2820470933>3.0.co;2-k. PMID 6164480. ↑ Khatua S; Nair C; Ghosh K (2004). "Immune-mediated thrombocytopenia following dactinomycin therapy in a child with alveolar rhabdomyosarcoma: the unresolved issues". J Pediatr Hematol Oncol. 26 (11): 777–9. doi:10.1097/00043426-200411000-00020. PMID 15543019. ↑ Jaffe, N.; Paed, D.; Traggis, D.; Salian, S.; Cassady, J. R. (1976). "Improved outlook for Ewing's sarcoma with combination chemotherapy (vincristine, actinomycin D and cyclophosphamide) and radiation therapy". Cancer. 38 (5): 1925–1930. doi:10.1002/1097-0142(197611)38:5<1925::AID-CNCR2820380510>3.0.CO;2-J. PMID 991106. ↑ Uberti, E. M. H.; Fajardo, M. D. C.; Ferreira, S. V. V. R.; Pereira, M. C. V.; Seger, R. C.; Moreira, M. A. L. R.; Torres, M. D.; De Nápoli, G.; Schmid, H. (2009). "Reproductive outcome after discharge of patients with high-risk hydatidiform mole with or without use of one bolus dose of actinomycin D, as prophylactic chemotherapy, during the uterine evacuation of molar pregnancy". Gynecologic Oncology. 115 (3): 476–481. doi:10.1016/j.ygyno.2009.09.012. PMID 19818481. ↑ Hagemann, R. F.; Concannon, J. P. (1973). "Mechanism of intestinal radiosensitization by actinomycin D". British Journal of Radiology. 46 (544): 302–308. doi:10.1259/0007-1285-46-544-302. PMID 4720744. ↑ Sobell H (1985). "Actinomycin and DNA transcription". Proceedings of the National Academy of Sciences of the United States of America. 82 (16): 5328–31. doi:10.1073/pnas.82.16.5328. PMC 390561 . PMID 2410919. ↑ Waksman S A; Woodruff H B (1940). "Bacteriostatic and bacteriocidal substances produced by soil actinomycetes". Proc Soc Exper Biol. 45: 609–614. ↑ Toba, K.; Koike, T.; Watanabe, K.; Fuse, I.; Takahashi, M.; Hashimoto, S.; Takahashi, H.; Abe, T.; Yano, T.; Shibazaki, Y.; Itoh, H.; Aizawa, Y. (2000). "Cell kinetic study of normal humanbone marrow hematopoiesis andacute leukemia using 7AAD/PY". European Journal of Haematology. 64 (1): 10–21. doi:10.1034/j.1600-0609.2000.09005.x. PMID 10680701.